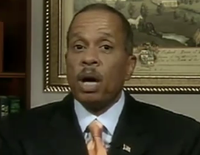 Juan Williams Hit the Lottery! Juan Williams hit the lottery. He gets fired by NPR, received sympathy throughout most of America for expressing thoughts that many Americans have about radical Islam and then gets a big money deal from Fox. Kind of an up yours to NPR. So Juan won the lottery because he not only got more money through the deal with Fox but more people will actually hear him, and he will thus have more of an impact.